Downtown Truckee’s Burger Me! launched a new Web site this month, featuring a playful design, lots of interactivity, and information about the hamburger joint. 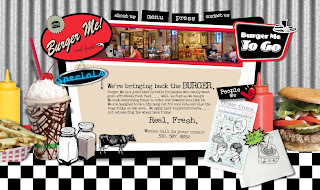 Through the new Web site, www.burgermetruckee.com, visitors will find Burger Me!’s latest specials and sources of the restaurant’s meat and produce. Visitors with a few minutes to kill can also play the game Burger Time. “This new Web site represents the vibe in our burger joint. It’s a great way for our current customers and people who haven’t dined with us yet to get a sense of who we are and what we offer, ” said Tom Farina, manager of Burger Me! Local marketing and graphic design firm SmallPond Studio designed and developed the Web site. The firm used Flash to create the highly interactive burgermetruckee.com. The site was built so it can still be indexed by search engines and viewed by computers without Flash, including cell phones. Burger Me!’s philosophy is to use the best, all natural products they can find, free of chemicals or growth hormones. Whenever possible, they buy products locally. Burger Me! is located in Brickelltown, at 10418 Donner Pass Road, Truckee. Call them at (530) 587-8852.